Back pain relief treatments for disc and nerve pain. Healthworks of Summerville is excited to offer the Triton Decompression Traction System (DTS) to qualifying patients. Spinal decompression can be a viable alternative to surgery for relieving lower back pain, neck pain, and reducing radiating arm and leg discomfort. Our FDA-cleared Triton Spinal Decompression System utilizes modern technology to effectively treat lower back, neck, and associated radiating arm and leg pain. The process decompresses spinal discs and facet joints by using traction and specific body positioning to alleviate stress on the targeted area providing, in most cases, immediate back pain relief. Studies show that most pain related issues within the back are due to spinal disc injury. Gravity and daily activities increase pressure on our spinal discs and this can lead to disc protrusion, herniation of the spinal discs and bulging discs. Our integrated therapy approach can help alleviate the pain and allow the body to heal. By using the Triton Spinal Decompression System, we can effectively treat your condition and help you avoid costly surgeries and extended recovery times. The more antiquated form of traction is a direct, consistent force that is put on the patient’s body to relieve the pressure of the body’s joints, muscles, and distinctive structures. For example, hanging upside down on an “inversion table” is a run of the mill system to put the spine into balance. Inversion tables use one’s own body weight to relieve pressure on the spine. Static traction has not been proven successful in treating herniated discs. Inversion tables may be contraindicated for patients with vascular disease, heart issues, hypertension, and several other conditions. Spinal decompression has been around for over 1000 years and it has seen a variety of evolution over time. The Triton Decompression Traction System uses computer technology to control variations in the unloading (traction pull) of the spine, effectively avoiding the body’s muscle contraction response, which makes many of the older methods and systems ineffective. Older forms of traction can be painful and provide little to no relief. Their lack of success has to do with our spinal muscles natural tendency to contract when being pulled. The Triton DTS addresses this known issue and uses modern technology to offset the stress, allowing your body to heal and providing back relief that can last. Our Triton DTS table is designed for your comfort and support. 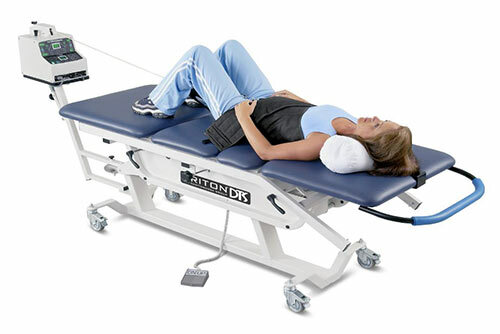 After lying on the table and being fitted with the support system, the computer-controlled Triton DTS allows us to adjust your decompression therapy to the proper angle and specific spinal zone of your problem. This, targeted computerized control along with the split table allows us to target specific discs and reduced frictions, allowing for comfortable, long-term decompression of the spinal disc. The typical patient experience is gentle, painless and relaxing, with intermittent pulling sensations along the spine. How Long Are Treatments And How Many Do You Need? A patient who is a good candidate for spinal decompression therapy will undergo at least 24 treatment sessions in conjunction with custom exercises given by our doctor. The average decompression session lasts 20 to 30 minutes. Please keep in mind that this is the average and may be adjusted according to the patient’s specific needs and condition. We have seen many patients benefit from treatment and experience substantial relief after as few as 3-5 treatment sessions. Every patient experience is different. Modern spinal decompression therapy is one of the most gentle forms of bio-mechanical treatment available. The Triton DTS is at the forefront of this treatment option with their FDA cleared equipment which has a proven track record of safety and efficacy. A lot of our patients fall asleep during their treatment due to the relaxing and comfortable nature of the spinal decompression treatment. How Long Will My Treatment Program Be? 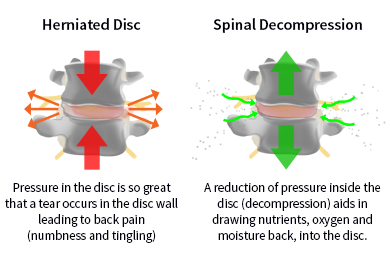 Although each patient is unique, the average spinal decompression treatment plan lasts 8 weeks with 3 treatments per week. During the treatment plan, your progress is regularly evaluated by your doctor and your treatment schedule frequency will be reduced or increased based on their findings. Why Is This Type Of Therapy More Successful Than Others? Since most back pain is caused by trauma to the disc, integrative therapy utilizing spinal decompression and therapeutic exercises has been proven to be the least invasive approach to helping the body to heal. Our integrative approach aids in repair and rehabilitation of the focus site and supporting structures to help you achieve long-term benefits and pain relief. Why the Need For Therapeutic Exercises And Other Therapies? The strength of the spinal muscles play a vital role in helping you heal and maintaining the integrity of your treatment. Poor muscle strength can lead to decreased spinal stability, disc degeneration, pain and overall loss of function. By using therapeutic exercises, heat, electrical stimulation and joint mobilization we can reduce inflammation and muscle spasms, increase mobility, improve strength and stability of surrounding musculature, reduce pain and help you avoid future injury. Will My Pain Go Away For Good? No one can guarantee the future, but our experience has taught us that most patients do find long-term pain relief and are either completely healed or are able to effectively manage their pain through exercise and lifestyle changes. As with any comprehensive rehabilitation program, it is important to continue your home exercises and use discretion with your daily activities to maintain the benefits of our integrative services. How Much Will Spinal Decompression Cost? Since insurance coverage varies between insurance plans, we will review all costs, payment options, and insurance coverage before treatment begins. Let us do the work for you! Share your contact information and we will contact you at a time that is convenient for you. Healthworks of Summerville, SC is one of the Lowcountry's leading healthcare providers. Our goal is to provide the same depth of service provided by larger healthcare networks in a friendly, family-oriented environment. * Results may vary by person.